The Klon Centaur is one of the DIYer's favorite pedal. Indeed, the original version of this mythical overdrive actually costs more than 1500 euros! This pedal is more like a legendary unicorn than a real pedal that you can test one day... Even the reissue, the KTR, which is not hand assembled costs more than 300 dollars... The amount of clones (aka "klones") of this pedal has grown insanely over the years: JHS, Rockett, ARC Effects, Electro Harmonix with the Soul Food, almost every pedal manufacturer has issued their clone, always closer to the original pedal. Recently, different PCB makers made Klon Centaur PCBs available, so you can make your Klon Centaur yourself. I used a PCB from Aion Electronics, the Refractor overdrive. This PCB is amazing, a fantastic work has been done by Aion Electronics to make the circuit fit a 1590B enclosure ! If you want something a bit bigger (for instance if you want to make a Klon-like look), you can use the Madbean Sunking PCB. I also wanted to see if there were audible differences between my EHX Soul Food and a replica of an original Klon Centaur (without the goop ^^). I used a prepainted enclosure from Banzai Music, in a classic gold color to make it look like the first golden Klon centaur pedals. I used a stamp to "print" a centaur on the enclosure with China ink. Then, I varnish the enclosure. I used a french website, called tamporelle, to make a custom inkstamp. It was very quick, and the stamp is of really good quality. Plus, it is quite cheap. I really like the result, it is not really easy first, but after a few tries it looked good! I also used my laser engraved plate on the front side of it. To compact the Klon circuit in a 1590B enclosure, a fantastic work has been done by Aion Electronics. The PCB is very compact, yet quite easy to populate because it uses classic components, and you do not have to place resistors vertically. The PCB is of excellente quality, double sided of course. The guide made by Aion Electronics to help you to build it is really detailed and well done. If you want to make a small Klon clone, I really advise you to use this PCB. However, it is not an easy build. The compaction of components is quite high, and you have to be quite precise when drilling the enclosure. Fortunately, the build document is really complete, and you have a drilling template included. Mine worked directly on the first attempt (This is a rare thing when building pedals...) ! I decided to build a replica of the original Klon Centaur circuit. I used tantalum, electrolytic and film capacitors like it was on the first Klon Centaur pedals. For that, I used the document realized by Martin Chittum from freestompboxes.org in 2009. Indeed, the original pedal is gooped. Goop is a kind of black resin that embed the circuit and components, and prevent you to trace the circuit. 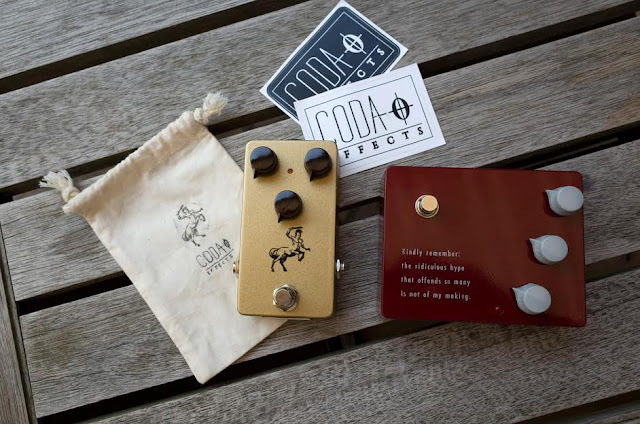 The freestompbox community decided to buy a Klon Centaur, and sent it to Martin Chittum who managed to "ungoop" the circuit and trace the schematic of the Klon Centaur, and report precisely the components used. These are really basic germanium diodes, quite surprising for these mythical diodes! The D9E are old soviet diodes, so it is true that managing to grab some of them in 1991 (when Bill started to develop the circuit), two years only after Berlin wall's fall, must have been difficult! Moreover, the marking is different between the soviet diodes (blue mark on the anode) and the diodes that you can find in the Klon Centaur (black mark on the cathode). For me, it is probable that diodes used were 1N34A, but maybe as he is saying these diodes were from a batch that sounded a bit different from more recent 1N34A... D9E sound good to me and have the right measured voltage drop anyway, so I'll keep using them. As you may know if you know me or follow my blog, I am really sceptical about the Klon "mythical" reputation. My Soul Food seemed like a good reproduction of the sounds delivered by the Klon, and I did not really get the buzz around this pedal. It is a nice clean boost, and good for really light saturations, but was a little too trebly for my ears. With more gain, the pedal becomes really "transistor" sounding, and quite boring... Finally it became more my boost pedal than a true overdrive pedal. So I started to test the pedal without great expectations. I have to admit that I was surprized! If the pedal really sounds like the Soul Food in low gain settings (really nice for light crunchy riffs), the high gain settings sound really nice with the Klone! I am really surprised... I will do a blind test to be sure that my brain is not playing with me, but it seems like there are differences with high gain settings. 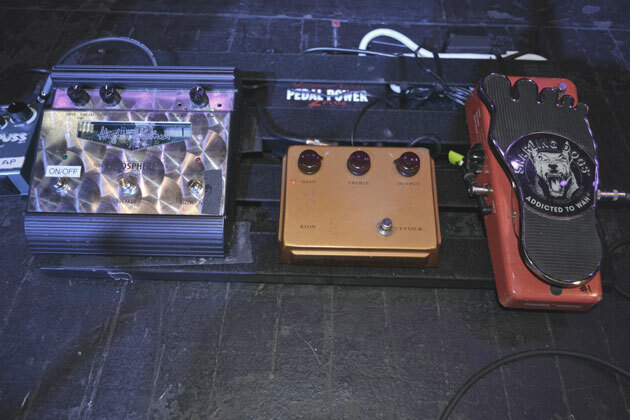 The pedal was compared to a Klon KTR, and sounds are really close, no audible difference between them. Proof that everything is about circuit and components, and not mojo and magic! You understood, it is really close to the KTR. If you want to have an idea of how it sounds, listen to demo video of the KTR. I will try to record samples as soon as I get gear for recording audio samples. I am currently making a small serie of 5 pedals to buy some gear to record proper video and audio samples... Send me an email if you are interested. A second OP amp with a gain of 2 (look at the values of R22 and R24) will allow to set the final amount of trebles in the output signal. It is a classical high pass filter: you let the signal go through until a certain frequency, defined by the C14 capacitor. Decreasing the value of this capacitor will let more treble go through. A common mod is to increase the value of this cap to have less treble (we will see it later). The amount of trebles that can go through this cap is set by the treble potentiometer. I hope it still gave you an idea about how the circuit works. If you have any question, do not hesitate to post a comment. Lets have fun now that we know the circuit: what can we mod? Increase C14 value: it is a very common mod to set the tone response a bit better. It allows a bit more bass to go through and make the Klon less "thin sounding". I usually use a 6.8nF capacitor, treble pot is thus more useable. Separate the dual gain potentiometer in two pots: instead of using a double potentiometer, you can split each parameter with two 100k potentiometers. You can choose how much clean signal you will blend with the overdrive sound, or use only the overdrive part of the circuit. It is also useful for bass, if you want to let more bass goes through the circuit. I guess that the blend potentiometer on the bass soul food comes from this mod. 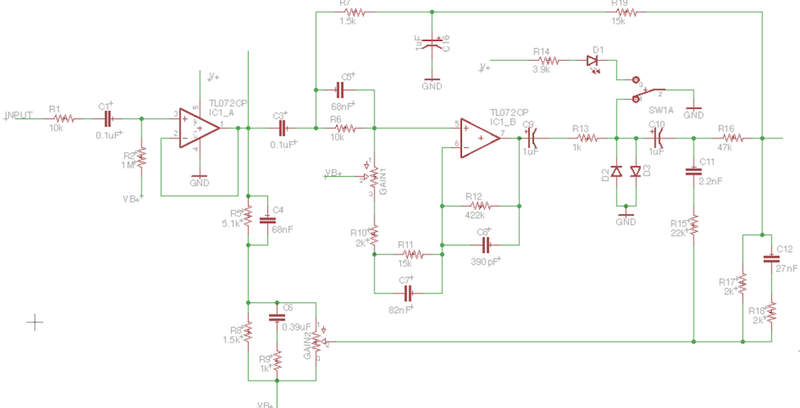 Diode clipping switch: you can choose between two sets of diodes with a simple DPDT switch. This is what I did with my Soul Food mod. There are not much changes between germanium and silicon diodes, however LED gave some nice results. There is much more headroom, it feels a bit like a distorsion! Bass switch (madbean "fat" switch): this switch will affect the amount of bass that goes through the second OP amp. To do that, we can add a switch to choose between the 82nF stock capacitor and a 150nF one for C7. Bass contour mod: instead of using a switch, you can use a 50k potentiometer to blend the higher value capacitor in. You can also use a bigger value like 220 nF or even 1uF! However, you can see that this mod is only acting on the saturated part of the circuit, and not on the clean signal that is blend later. Thus, it is more hearable with high gain values... To have a proper bass knob, you can try to use a double potentiometer, and blend a higher value capacitor in parallel of C4 (68nF) too! I have never try that, maybe I will give it a shot at one point. Using different OP amps: instead of the TL072CP, you can use different less noisy OP amps, or more "classic" overdrive OP amps. The simplest solution is to use sockets for OP amps, and try any double OP amp IC that you would like. To test: LM1458, OPA2132, LF353, JRC4558D... Any double OP amp can give you interesting results! Increase gain: to have more gain on your unit, you can modify R10 resistor. It has a 2K resistor originally, and you can use a lower value to have more gain, or even a jumper! 1994's specs switch: in 1995, Bill Finnegan slightly modified the circuit (see below). Most of the changes were not affecting the sound, except the addition of R11 (15k resistor), that was supposed to boost a bit the bottom mids. If you want to hear what that does to your tone, you can put a switch there to choose between the 15K resistor or a jumper. I will try to do some videos of some of these mods. Gold and silver klons were produced at the same time, however the silver Klon was introduced in the early 2000s, and the graphics changed a bit with time. Three graphics can be considered: no centaur, big centaur with "open tail", and small centaur with closed tail. There were 5 different colors: 4 different gold colors (that you can see on the picture above), and the bare polished aluminium color (aka "silver" centaur). 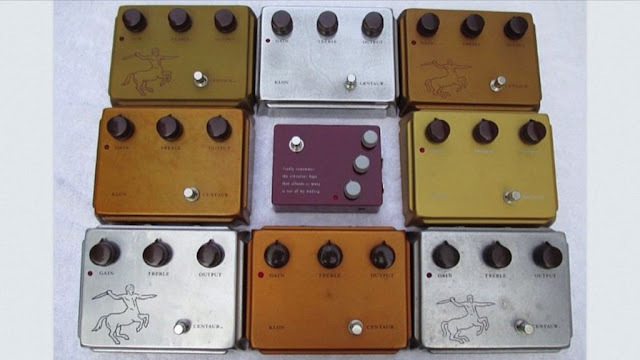 Around 8000 Klon centaurs were made between 1994 and 2009 according to Bill Finnegan (1.5 Klon centaur a day!). All those Klon worth today more than 12.000.000 euros! The KTR version was issued in 2012. It basically has the exact same circuit as the Klon centaur, and the same diodes for clipping, but it was intented for mass production. It uses surface mounted devices (SMD), so the production could be automatized (the KTR is not handmade, but made by robots), so Bill Finnegan could focus on control quality. The price tag is still high though, especially for a mass produced device. The four years during which the Klon was discontinued has been the Klones golden age, and a lot of klon clones were issued during these years. Even today, as the KTR is quite expensive and big, there is still a lot of room for klones, and some builders find their way there (Rockett for instance), making Bill Finnegan a bit angry. Indeed, it is a bit smaller than previous versions, but uses 1590BB enclosure. Bill spent a lot of time testing different SMD components to make it sound exactly like the original Centaurs units. He also avoided to use electrolytic capacitors, and kept the tolerances of the components low, in order to have similar sounding units. Maybe next Klon product will be a numerical SMD pedal (not klonable!). Obviously, the Klon case introduced the ethical problem about cloning pedal in the DIY and guitar pedal afficionados community. As there is almost no legal protection to clone circuits, the only barrier is ethics. I think it is an interesting debate to have. I am currently writing an article about that, including some pedal patents and reflexions about cloning. The name "Klon" is a shortener for "Klondike", a region of the USA famous for its gold rush during the 19th century (among other facts). 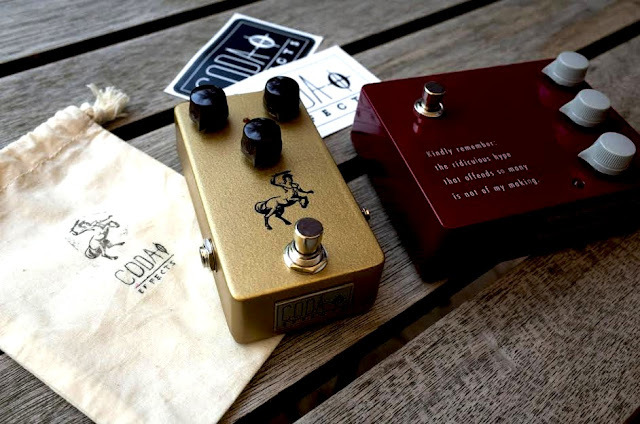 Some people are ready to spend more than 2000 dollars for the original version of the Klon Centaur! Really nice! Thanks for the info!!! Did you make or sell your series of 5 yet?! Hey, can you elaborate on the ink and stamp technique you used. What is china ink? I ordered some rubber stamps but would love some info on how you got yours to look so great! Thanks. After applying the stamp, I coat the pedal with 3 layers of varnish. a] You have R17 & R18 = 2k, on most other schematics, R17 = 27k, R18 = 12K. Any reason for that change? b] The R7 / R19 junction is AC Ground due to C16, so no clean signal is being sent forward through R7 / R19. They are both just sharing the top of C16 to ground. - your R12 and R20 are Dale CMF55 metal film resistors. Why you choose them on that places? - are the rest of all your resistors metal film 1/4W? - you C11 is WIMA (I don't know the model, please could you tell me), and C8 and C13 are ceramic disc capacitors. Why you choose them on that positions? - on C14 there is some blue capacitor, could you tell us which one and why? - Which electrolytic caps (brand, series) you used for this project? Thank you very much in advance! This is not for commercial purposes, but only to educate myself and the others why to choose certain types of components on certain places. Thank you again! - the values of the resistors in the loop are 422k and 392k. I simply could not find any standard metal film resistors with these values, so I use top notch CMF55 resistors here! - regarding that Wima capacitor: I would have loved to use one of my beloved Panasonic SMF capacitor here, but unfortunately, they are not produced anymore, so I use a Wima instead. The value of the component is often more important than the nature of the component, for instance changing a Wima for a Panasonic SMF will probably not change the sound a lot, whereas changing a 68nF value by a 47nF one will surely change the sound of the effect a lot more! I'm going at it the same way you did and I am trying to source as many original components as possible. Can you tell me what Wima caps you used? The 63V instead of 50V panasonics? I still have a small stock of the Panasonic ECQ-V caps but not for all values so I will need to replace them with good substitutions. Also the elco's are no longer available from Panasonic, would love to hear with what you substituted. I've recently build my aion refractor pedal following your post. No particular problems during the building process but I have some doubts about the sound. My pedal in particular has too much boost on the mids (really too much) and it cuts a little of bass frequencies... any suggestions? I need to repair mine, can anyone tell me how to remove the resin?? If you have an original one, I think your best shot would be to contact Bill Finnegan directly, I might still have some spare PCBs and repair it.